laundry using our "James Washer"
One of the biggest challenges when we moved into our off grid shouse was laundry. I was ill prepared to take on the task of doing laundry without my washing machine. At first, I just loaded up all of our clothes about once every two weeks and headed off to the laundromat. That got very expensive very quickly! After about a month and a half, the laundromat in our town closed and the next closest one was a half an hour drive away - on the twistiest road known to man! Now, not only was doing laundry expensive, it was terribly time consuming - and dangerous on winter roads. I had to come up with a better solution. We had no running water and no drains and it was the middle of winter, so my laundry methods had to be creative. 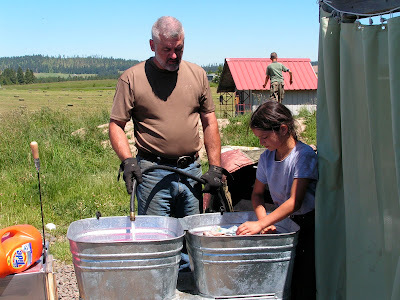 The first thing I did was dig up and thoroughly clean my five gallon galvanized washtub. 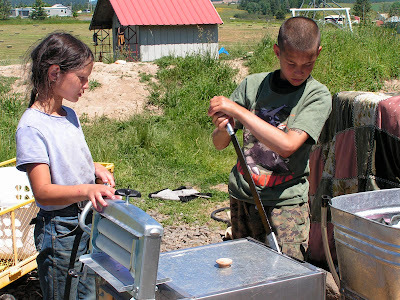 I started the generator, put the galvanized tub on my wood cookstove (over the firebox) and fill it with cold water from our garden hose. I added soap (the homemade kind that I had made with Fels Naptha and Borax) and started washing. I scrubbed the dark clothes first, because I could wash them in cold water. I had to work fast because the water heated up very quickly! Soon, I was scrubbing away at the whites in VERY HOT water! Sweat would be rolling off my face, my hands were red and rough and I have to admit, I felt very sorry for myself. After washing all of the clothes in soapy water, I would toss them into a laundry tub on the floor. Then I would haul the five gallon tub of dirty, hot, gross water out of the house (remember, I had no drains!) and dump it off to the side of our driveway. Then I would rinse out the tub, fill it with clean water and start rinsing the clothes. Once again, I started with the darks (in the cold water) and quickly worked my way through to the whites. After I had rinsed all of the laundry, Maid Elizabeth and I would take the whole lot into the bathroom and wring each piece of laundry by hand. 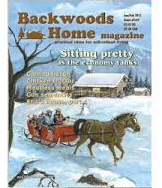 Here we were, living off the grid, doing laundry on the wood cookstove, and I had no wringer! I must admit, for as much effort as we put into hand wringing each item of clothing, they were still full of water when we were done. After rinsing and wringing, we hung the clothes to dry. We had a drying rack that we had bought from Lehmans for Y2K that we set up in front of the wood cookstove. It took about 3 days to completely dry the laundry (boy, a wringer sure would have been nice!). It was soooo inconvenient. I had to move the entire drying rack every time I needed to add a piece of wood to the fire, and cooking around hanging laundry was extremely challenging! One of the problems was the drying rack essentially hung clothes over the top of each other. The clothes on the top of the rack would dry, but everything down below would be soaking. I had to rotate the clothes from the bottom to the top to get everything to dry properly. And, with limited room in our shouse, the drying rack took up WAY to much room, even when folded. Eventually, I came up with a drying "horse" that hung from the ceiling and lowered on a pulley. I told Sir Knight about my idea, and a half an hour later, I had a drying horse hanging over my wood cookstove! It was heaven on earth! 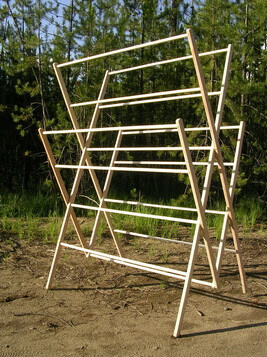 I disliked my other drying rack so much, that I eventually gave it to a dear friend of mine. She has a lot of room, and she just leaves it up all of the time. Recently, some friends of ours began their own off-grid journey. They, too, started doing laundry by hand and encountered many of the same obstacles that we had all those years ago. Their solution, however, was ingenious. 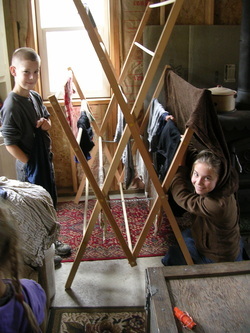 They made their own drying rack, based on antique design, that hung the clothes rather in a V shape, so the clothes on top didn't keep soaking the clothes on the bottom! It was awesome! Not only was the rack sturdier than the one we had used, it took up WAY less space, both standing and when it was collapsed. Theirs would easily slide behind the door or under a bed when not in use. Mine had required the entire corner of a room! They loved their new rack so much, that they decided to make a few for friends. They were a complete hit. 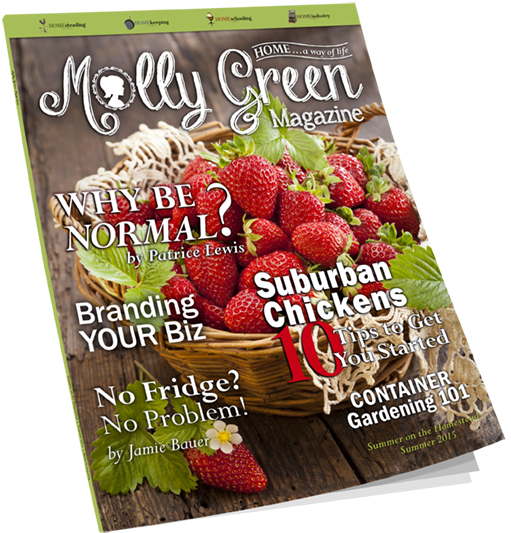 It is with great admiration that I introduce to you Forgotten Way Farms. I LOVE their drying racks. They now make them in three sizes - large, medium and small (although, even the medium rack holds a ton of clothes). They are built to exacting standards and will hold up to years of extreme use. I highly encourage any of you, who are currently looking for a drying rack, or want to have somewhere to dry your clothes "just in case", to check out Abby and Daniel's site. Having used drying racks for years, I am thrilled to be able to brag on my friends. A little old fashioned ingenuity goes a long way. Laundry without electricity is a daunting task. It is, however, made a little easier with the right tools! This begs the question: of the 2 systems (the drying horse or the drying rack), which is your favorite? I have contemplated using either the rack or the horse, but have decided against both. For me, designing a system that fits high above my bathtub and allows the wet clothes to drip into the tub is the direction I'm heading right now. Since I store some cases of food in the tub right now, I will have to find new storage sites for the food if I intend to go ahead with the tub drying system. This survival stuff is getting complicated. ROFLOL. I just bought the Homesteader model. This thing looks AWESOME! Thanks for recommending it! Thanks for this very helpful post. You are saying some of the VERY things I have been saying (wringing is no fun). So one year ago, I bought the Lehman's Best wringer and paid about $218 with shipping back then. I never took it out of the box until September of 2010, when I used my birthday money to purchase 3 large galvanized wash tubs (one for washing, two for rinsing). I used a clean toilet plunger as my agitator (marked "Laundry Use Only). Now here is the point I want to stress: The wringer was missing a part that held the handle onto the wringer. That missing 13 cent part (now obtained from the hardware store) would have rendered the wringer inoperable in a time of crisis. PLEASE practice your plan BEFORE there is trouble so that you know for sure that you are set to go. Thankful I did or I would have been in trouble! I didn't know what you used Tide laundry soap. I didn't know that you used "tide" laundry soap. How do you like your James washer? I have looked a them and would like your imput please. 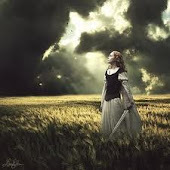 I am a christian, conservative, survival minded, homeschooling,off-grid, independent, home-birthing, Proverbs 31, Titus 2 minded 40 year old woman. I live with my husband and five children in our solar/generator powered shop on 30 acres. We are homestead types who try to do as much as we can ourselves, but understand the importance of community. The Best Carmel Pecan Rolls Ever! Have you ever seen the likes of this? Follow Paratus Familia by Email!!! All material copyrighted by Paratus Familia and Enola Gay. Theme images by bopshops. Powered by Blogger.